Be aware of the crossDomain: true. But take care! 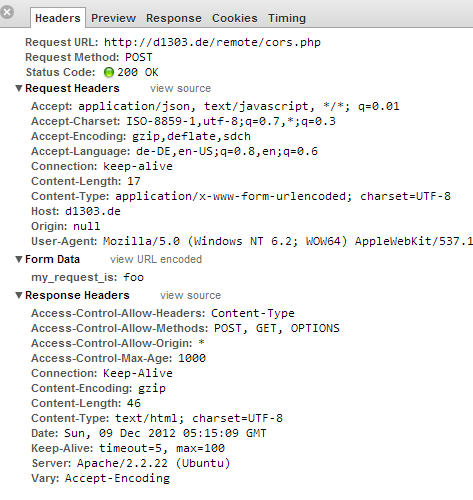 This will only work as expected, if the server side sends the appropriate response headers for CORS. For more ways to implement CORS on the server side, see enable-cors.org. Browser support is excellent (IE >= 8, Firefox >= 3.5, Chrome >= 3). Let’s move on to the next way of making Cross Domain AJAX possible: JSONP. Like CORS, the server has to support JSONP. Basically, the client tells the server the callback function for the response. The server then wraps the response in this callback function. Example? Example! jQuery is now able to invoke the success callback with this information. It is also possible, to specify your own callback with a more readable name, see the $.ajax docs. As far as I know, there are no browser compatibility issues at all. However, there is one big downside: There is no easy way to get the server response from our request, this is more like a „fire and forget“ one way-request. If you really want to stick to this approach, here is more info on that. Even though CORS and JSONP are the most popular methods of doing cross domain AJAX, there are other ways. Take a look at the relatively new window.postMessage (part of the HTML5 feature set) – examples here and here. Another classic approach that is typically taken for this kind of problem is to place a server side script in the language of your choice (e.g. PHP) on your server and request this script via AJAX – which is not a problem, because requesting side and responding side are on the same domain. Your server side script then forwards the request to the remote location and responds back to your script. See the excellent article Building a simple API proxy server with PHP for more details. Niemand soll wissen, dass die Webseite mit PHP läuft! Very interesting article, thanks for sharing. I think there might be a mistake though or I didn’t understood correctly: on CORS you said „For example, you can restrict the requesting domains like so:“ and I think it should be „For example, you can ACCEPT the requesting domains like so:“. Hey Alex, yep – you are right. Changed it. another way to circumvent the Same-Origin-Policy is using the script-tag, for which (to my knowledge) no restrictions apply whatsoever. One can combine that nicely with JSONP, for instance. This way, you won’t need to use AJAX, hence you won’t run into any trouble when testing locally without a webserver. Instead of firing an AJAX call, just create and inject a script-element in the page. If you attach event handlers for the onload and onerror-events then you gain the same magnitude of control as if using AJAX. Thanks for your comment, I think thats a good substitution for the iframe method. However, you only get the onload and onerror event but other than that no server reponse – like the iframe method. Thanks. Have any idea without iframe? Thanks a Lot.. This article helped me a lot to fix an issue in my clients website.. Keep posting. Your article was quite helpful! I had some hours dealing with this, thanks a lot! I use the following script for header authentication but its not working with IE and Safari. What is the best way to do cross origin request with header authentication ?